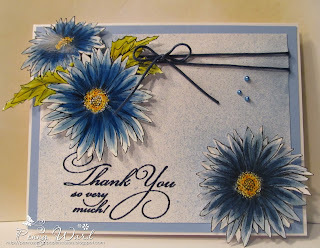 I was inspired by Elizabeth Allan's blog this week to color a card with Tim Holtz distress inks. I have used this technique before, but her added element of using glossy paper intrigued me. On the card pictured above, I spritzed TH Faded Jeans on white cardstock (2 drops of reinker ink in a mini mister filled with water). I then used Kodak high gloss photo paper and stamped it with Momento ink. Using the Faded Blue ink pad and a water brush, I started coloring and I LOVE the glossy paper. The brush strokes were SOOOOO much smoother. As I wanted a darker center to the flower, I just dabbed a drop from the reinker on my craft mat and picked up my color from there. Wild Honey and Marigold were used for the flower center. NOTE: The flower in the top left was colored on Glossy paper, (you can see where the camera caught the shine on top flower) and the flower on the bottom right was colored on 110lb cardstock. What a difference in the vibrancy of the colors!!!!! 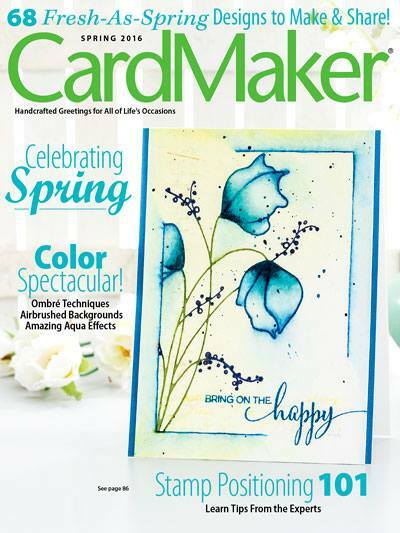 Fussy cut, add dimension by using foam adhesive, emboss sentiment with Lapis embossing powder, and attach to card base. A little blue cord and some blue Liquid Pearls. Done. Thanks Elizabeth for all you do...what a great mentor you are! Gorgeous card Penny. Your interpretation of the technique is marvelous! Thank you for your generous and kind words!